A considerable number of journal publications using a range of qualitative synthesis approaches has been published. Mary Dixon-Woods and colleagues (Mary Dixon-Woods, Booth, & Sutton, 2007) identified 42 qualitative evidence synthesis papers published in health care literature between 1990 and 2004. 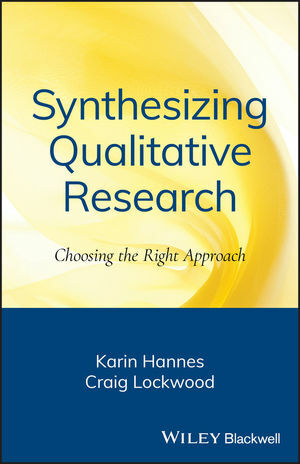 An ongoing update by Hannes and Macaitis (2010)identified around 100 additional qualitative or mixed methods syntheses. Yet these generally lack a clear, detailed description of what was done and why (Greenhalgh et al, 2007; McInnes & Wimpenny, 2008). Choices are most commonly influenced by what others have successfully used in the past or by a particular school of thought (Atkins et al, 2008; Britten et al, 2002). This is a substantive limitation. This book brings balance to the options available to researchers, including approaches that have not had a substantial uptake among researchers. It provides arguments for when and why researchers or other parties of interest should opt for a certain approach to synthesis, which challenges they might face in adopting it and what the potential strengths and weaknesses are compared with other approaches. This book acts as a resource for readers who would otherwise have to piece together the methodology from a range of journal articles. In addition, it should stimulate further development and documentation of synthesis methodology in a field that is characterized by diversity. Karin Hannes, PhD Doctor-Assistant, Centre for Methodology of Education, Department of Education, Leuven University and Belgian Centre for EBM-Belgian Cochrane Branch, Department of General Practice, University of Leuven. Craig Lockwood, RN Associate Director, Research and Education Unit, Joanna Briggs Institute, University of Adelaide. 1 “It looks great but how do I know if it fits?”: an introduction to meta-synthesis research (Barbara L. Paterson). 2 Obstacles to the implementation of Evidence-Based Practice in Belgium: a worked example of meta-aggregation (Karin Hannes and Alan Pearson). 3 Medicine taking for asthma: a worked example of meta-ethnography (Nicky Britten and Catherine Pope). 5 The Internet in medical education: a worked example of a realist review (Geoff Wong). 6 Mixed methods synthesis: a worked example (Josephine Kavanagh, Fiona Cambell, Angela Harden and James Thomas). 7 Bayesian approaches to the synthesis of qualitative and quantitative research findings (Jamie L. Crandell, Corrine I. Voils and Margarete Sandelowski).